Equipped with 98" monitor, mac, microphones, cameras, and HDMI and VGA cables. 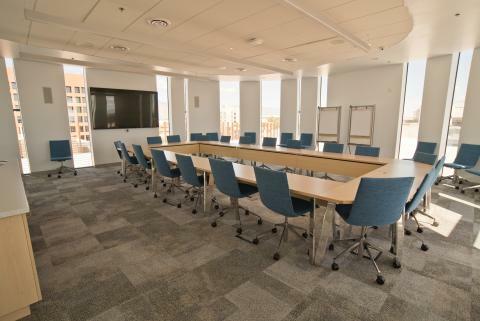 The Executive Conference Room is for IE use only; limited exceptions are available for special, one-time events by special request, M-F 9AM-5PM only. Please email ENR2roomres@email.arizona.edu for more information. Additional Information For Special Events: If your event includes food/beverage, has more than 50 people, or falls on a weekend, you must fill out Facilities Management's special event request form to notify custodial. This will ensure your rooms are clean and prepared, and bathrooms are fully stocked and supplied. After arranging custodial, please forward confirmation to enr2roomres@email.arizona.edu; if we do not receive this notification, we reserve the right to cancel your event. *Note, charges via FM may apply.